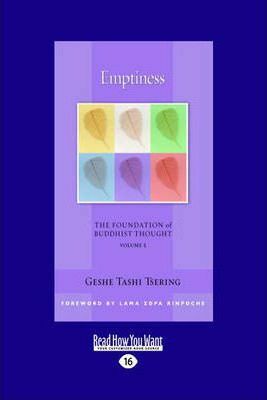 In Emptiness, the fifth volume in The Foundation of Buddhist Thought series, Geshe Tashi Tsering provides readers with an incredibly welcoming presentation of the central philosophical teaching of Mahayana Buddhism. Emptiness does not imply a nihilistic worldview, but rather the idea that a permanent entity does not exist in any single phenomenon or being. Everything exists interdependently within an immeasurable quantity of causes and conditions. An understanding of emptiness allows us to see the world as a realm of infinite possibility, instead of a static system. Just like a table consists of wooden parts, and the wood is from a tree, and the tree depends on air, water, and soil, so is the world filled with a wondrous interdependence that extends to our own mind and awareness. In lucid, accessible language, Geshe Tashi Tsering guides the reader to a genuine understanding of this infinite possibility.